Play through the various levels of this mind blowing online game that is rather very colorful and very exciting. 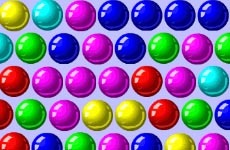 Control the gem to remove all the blocks leaving only the checkered blocks. Blocks are removed by jumping off of them. Use the arrow keys to jump one space to the next block. You will have fun playing the cool game.